Hi guys! Are you ready for this? 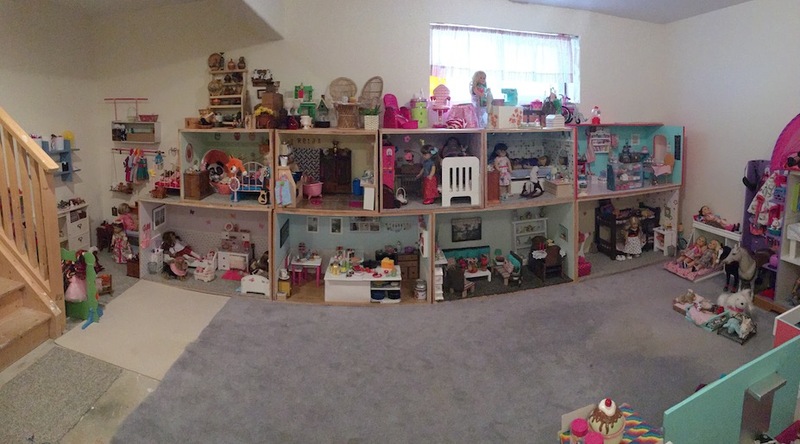 Okay, so as you all know, we have been busy building a crazy enormous dollhouse in our basement. 🙂 Well, today we are here to show you the final reveal of our Mega Dollhouse Project as well as some tutorials on how to build one of your very own. I won’t go into all of the finer details. Instead, I will leave a link below to where you can go on a tour of the dollhouse rooms. So sit back, and relax! We are going on a huge dollhouse ride! So, what you see above are eight 4ft x 8ft pieces of plywood that we cut to the measurements shown. 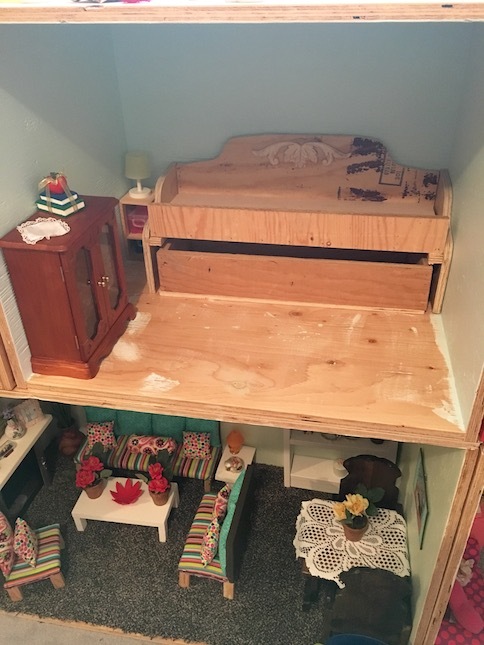 Now, we used 3/4″ plywood because I wanted to make sure that the dollhouse was sturdy in case someone decided to climb on top of it, or something. Not that anyone should ever do that. Ever. In hindsight, 1/2 inch plywood would have probably worked just fine. The plans above are for four 4ft x 2ft x 30″ boxes (green pieces) and four 2ft x 2ft x 30″ boxes (pink pieces). 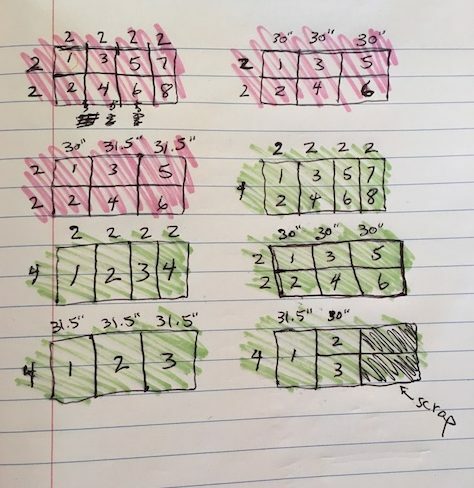 Be sure to notice in the diagram that there are four green pieces that are 4ft x 31.5″ and four pink pieces that are 2ft x 31.5″. When assembling a room box, you have to be sure that the back piece covers the opening completely. 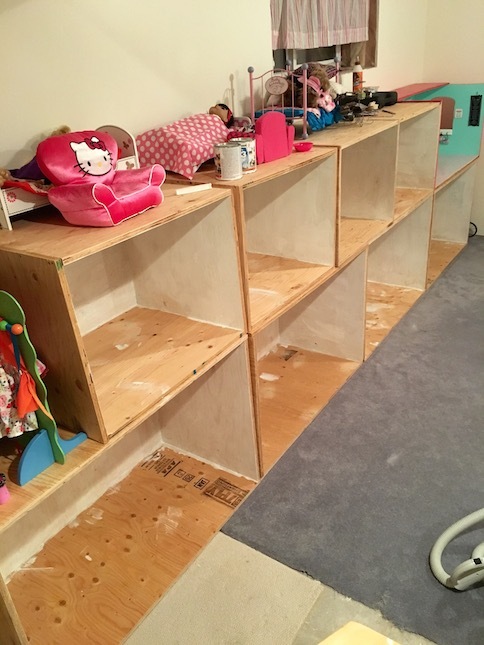 I had to add 1.5″ to the back pieces to accommodate for the 3/4″ plywood edge. 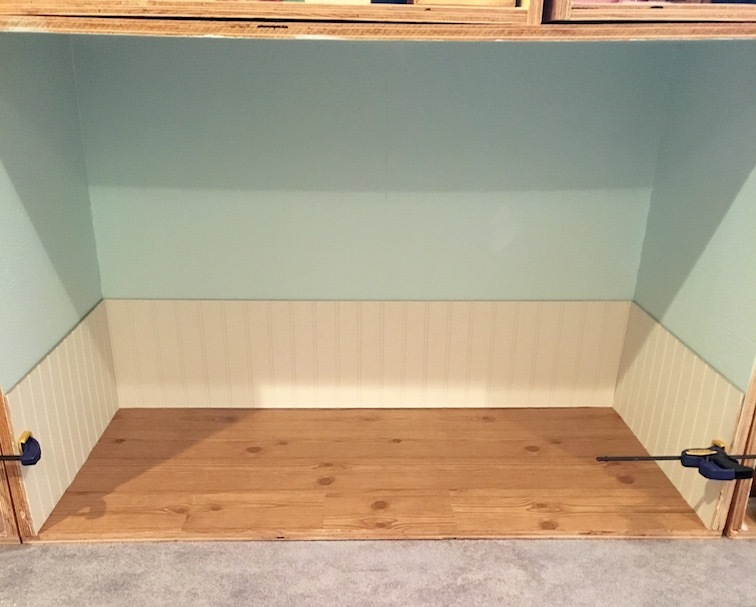 If you are using 1/2″ plywood, then you will only need to add 1″, otherwise the back piece will be too small, and there will be a gap. Okay, enough mumbo jumbo. Here are some pics of assembly. I used gorilla wood glue and 1.5″-2″ screws to assemble the boxes. Take very close notice of how I joined each piece of wood, because that makes all the difference for how the back piece fits on. The two sides should be inside the box holding the top and bottom pieces up. I hope that makes sense. 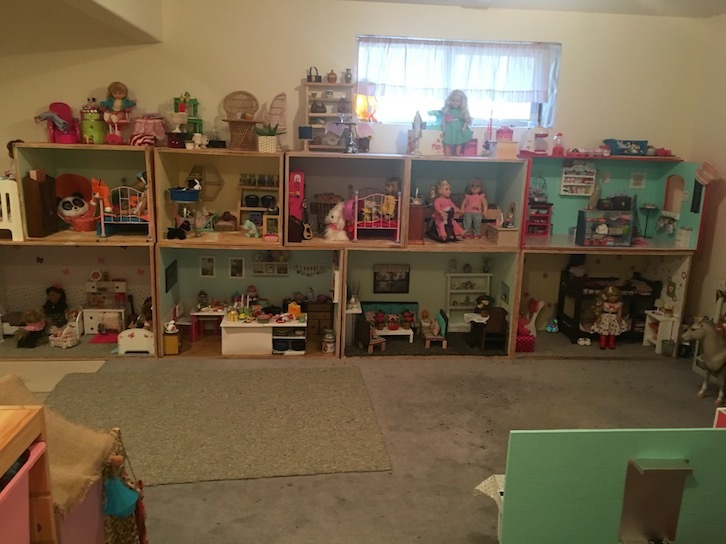 The wall that the dollhouse is against is 20 feet long. Here we were nearly done. I just had one more large room box to build. Next, I used wood filler to fill all of the knots. Let me tell you, plywood has a lot of knots, so be prepared. Do not skip this step!! After it was dry, I sanded. Then I primed all the walls. It was time to choose the paint colours! I left this part up to the Little Miss. She did a pretty good job! Lavender, mint green, yellow and sky blue. 🙂 So pretty! Okay, that’s a really dark picture. The window in the middle of the wall doesn’t help either, but you get the gist. 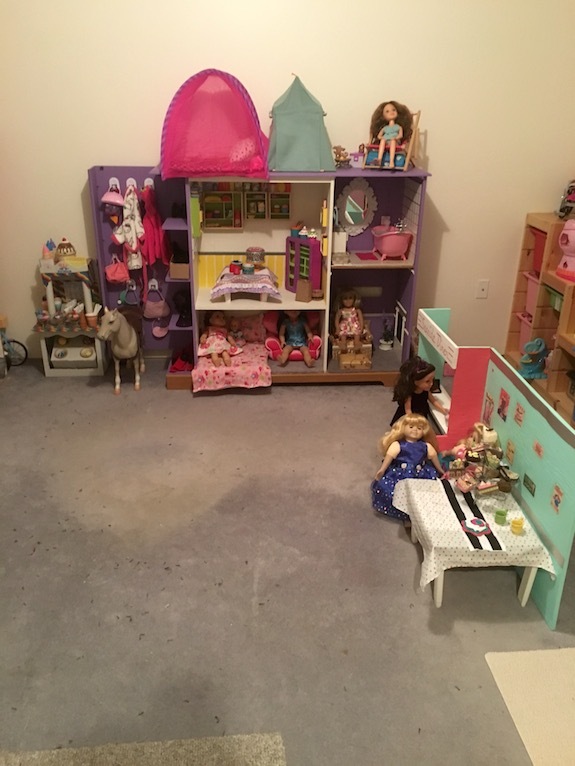 I knew that all of the dollhouse rooms would have carpet except for the kitchen and the bathroom. 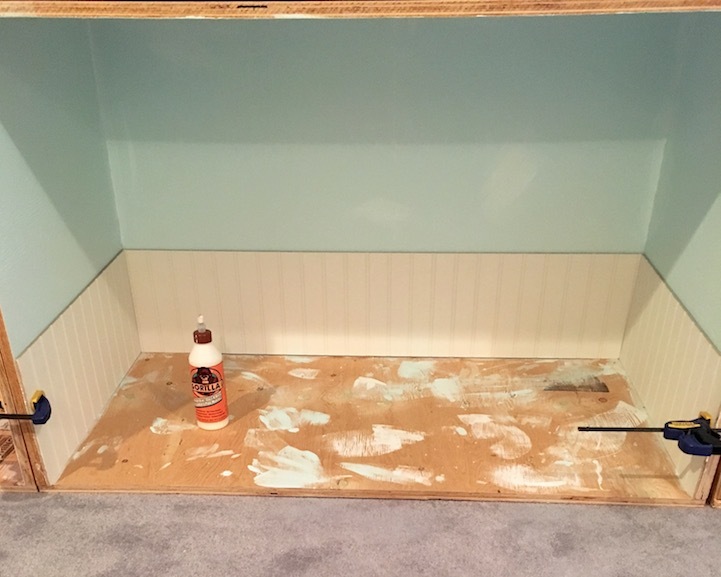 In the kitchen, I added some beadboard to the walls to look like wainscoting. 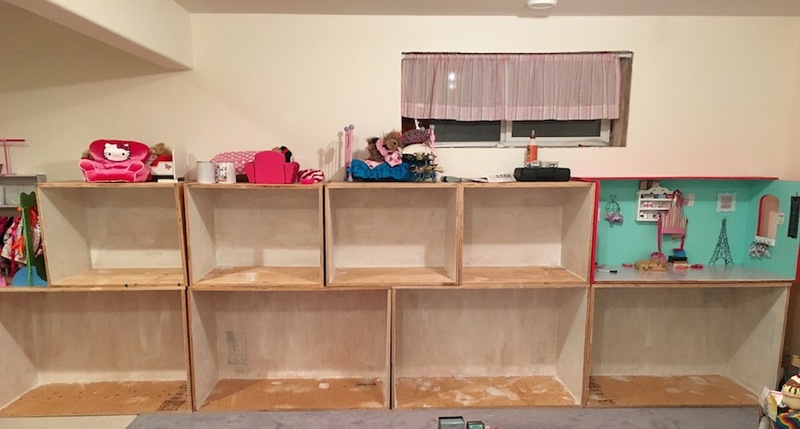 For the rest of the dollhouse, I decided to make a challenge for myself. 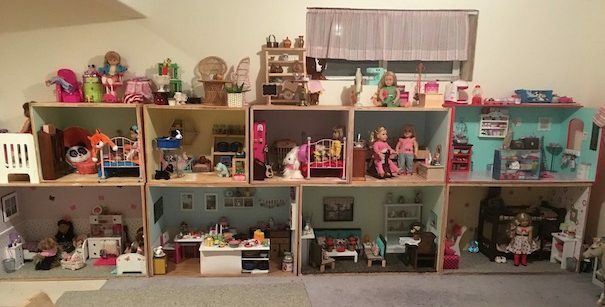 I would finish one room in the dollhouse per week, if it killed me. LOL! 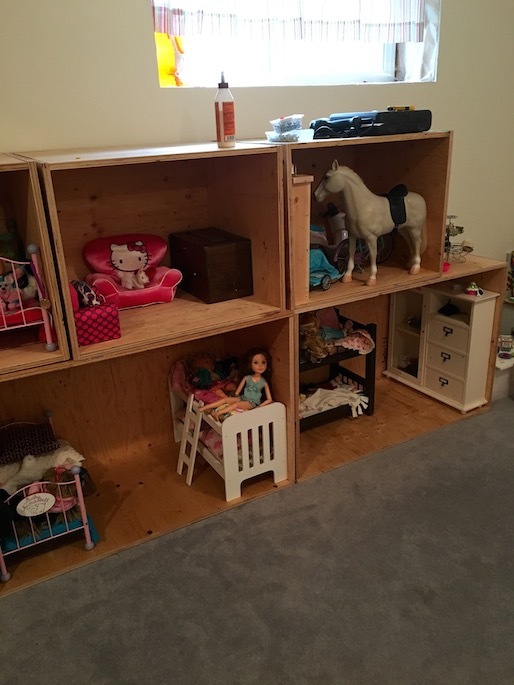 The dollhouse was coming together! 🙂 Some rooms quicker than others. I was beginning to really love the fact that everything seemed to be falling into place, and that everything had a place! Seriously fantastic storage solution. For real. 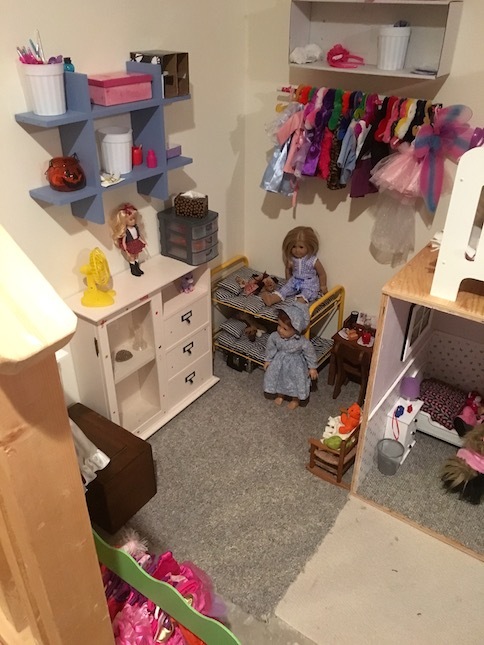 This corner at the far end of the dollhouse was empty, so we decided that we could use the space to build a room for the historical dolls. 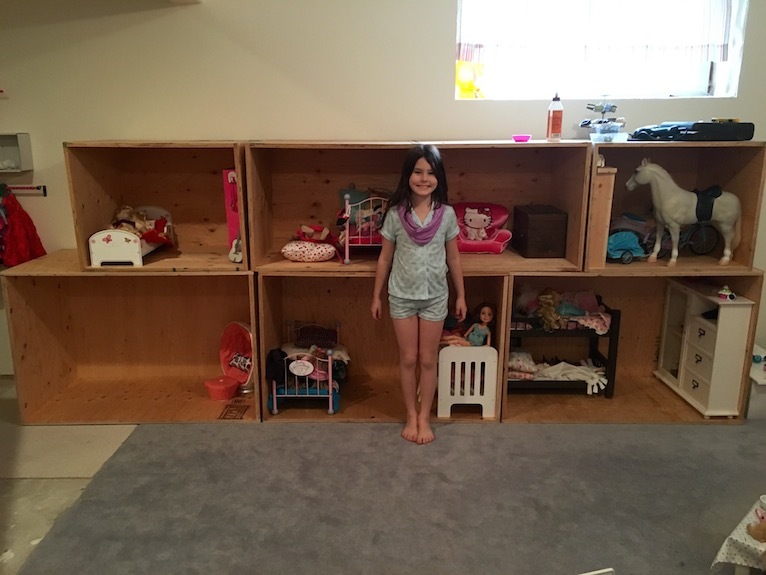 We used gorilla wood glue to install the dollhouse carpeting. We also installed contact paper for wallpaper. I was a bit floored that this project only took a matter of weeks, but once it was assembled and painted, it went pretty quickly. 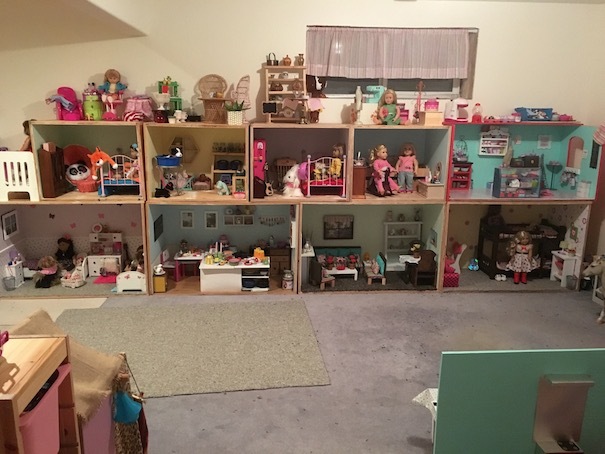 I tried to get some photos of the entire dollhouse. It’s tricky! Here are some panoramic shots. I’m still deciding what to do about the top of the house. 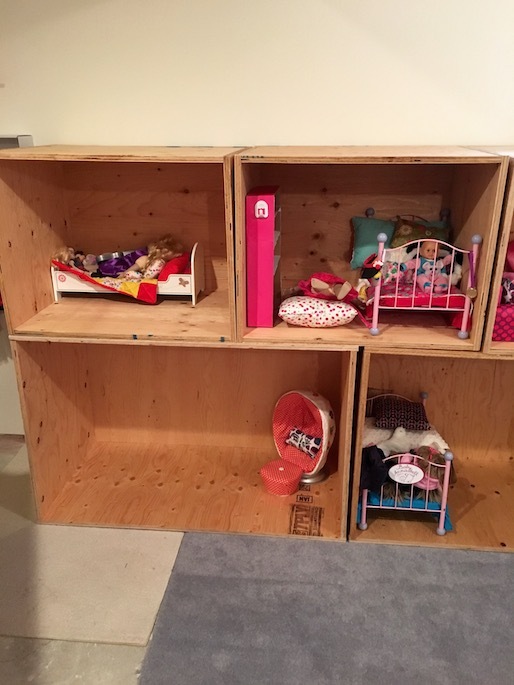 It’s kind of impossible for the kids to reach, so it doesn’t hold much play value, but it is a great storage space. Over in the corner is the first dollhouse that we built along with our DIY Maryellen’s Seaside Diner. In the other corner is our DIY Lea’s Rainforest House. 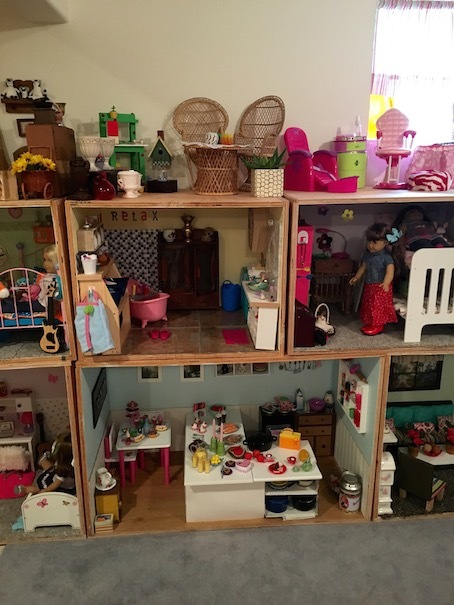 I hope that you enjoyed the finale of our Mega Dollhouse Project! 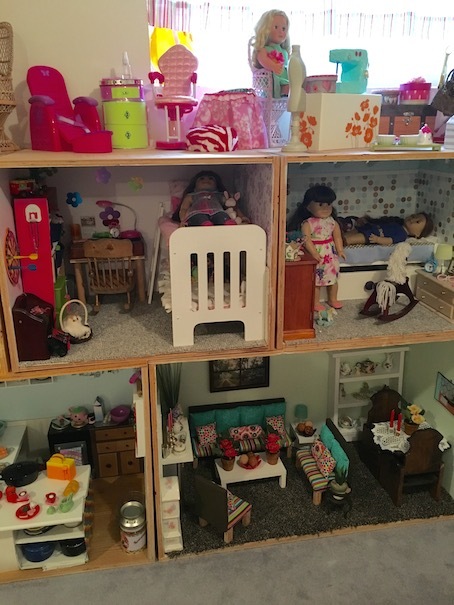 Also, stay tuned, because we have been building another dollhouse for the mini dolls, and we will have all of the fun details on that soon! This is AWESOME! 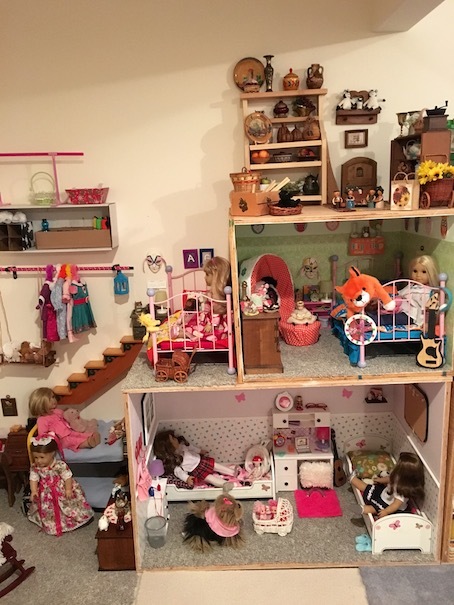 At the age of 57 and 3 granddaughters, this makes me want to play dolls every day with the grandgirls! They would think they were in heaven! The most I can do for them is make their doll clothes! I’m really speechless, it’s every little girls dream. Bless you, it shows a LOT OF LOVE!!! 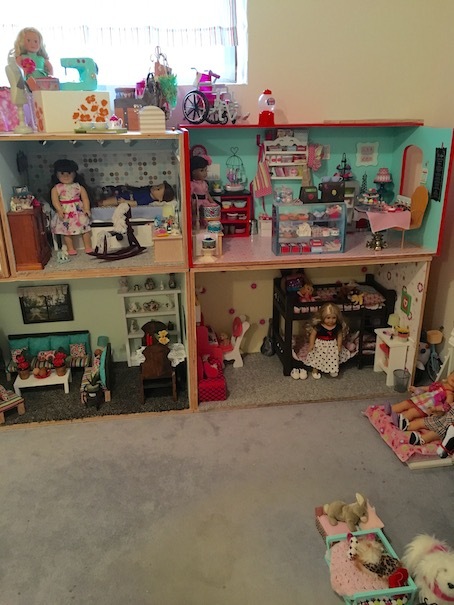 This is a GREAT dollhouse! (literally and figuratively) ha. What an amazing project. 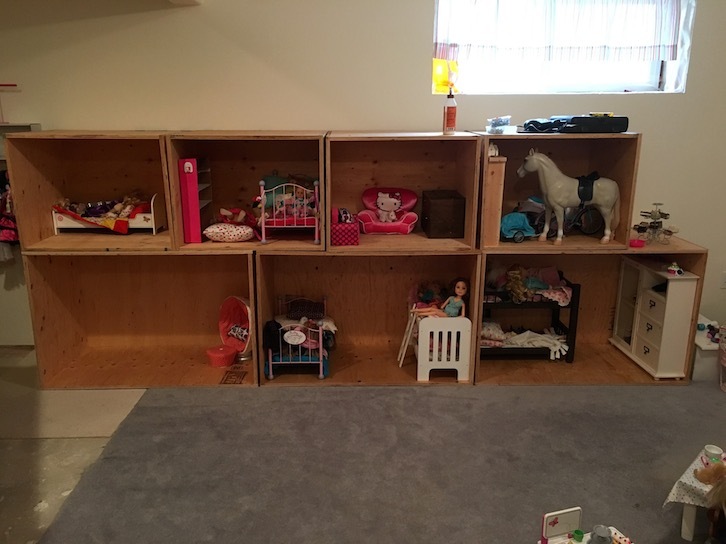 We used the box rooms for our dollhouse as well. It’s nice because you can rearrange the house. Of course that almost never happens, but it’s still a great idea. Thanks for sharing. You’re welcome! 🙂 I’m glad you like it! 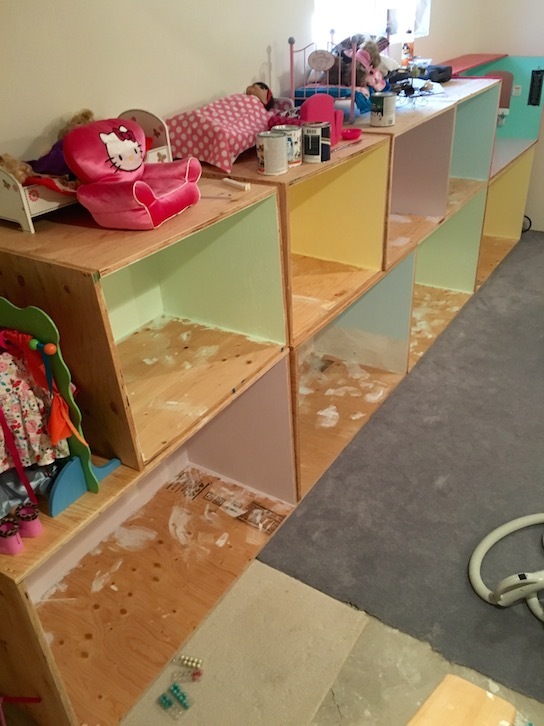 We are definitely not going to be rearranging our doll rooms either! LOL! 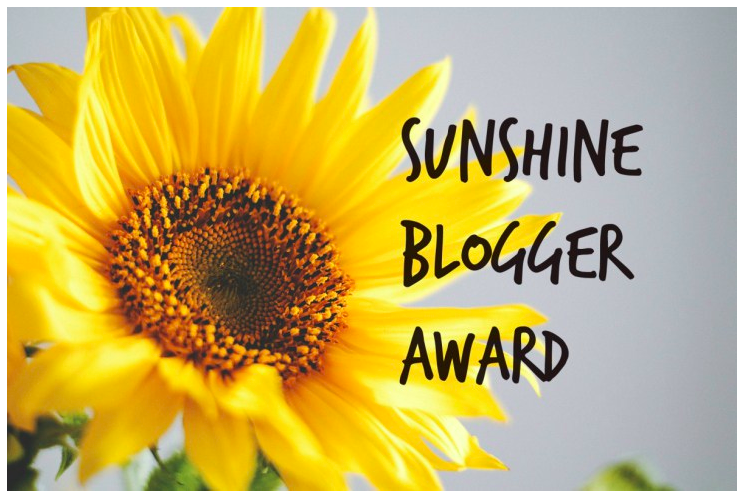 This is absolutely fabulous!!! 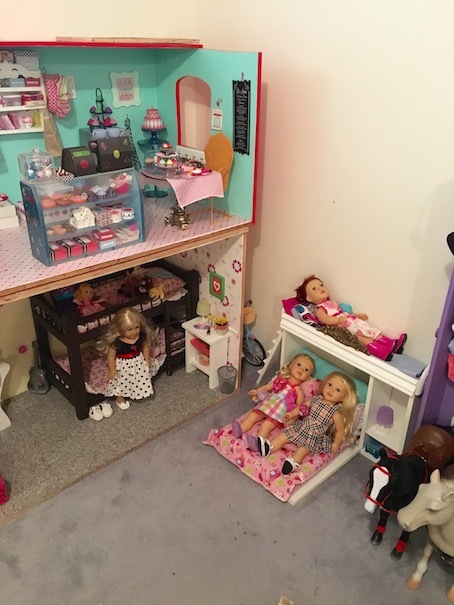 Our home is so small that my dolls have taken over every room except the bathrooms! It would be wonderful to have a basement! You did such a great job making and arranging the rooms! How much fun it would be to play there! I hope you husband’s toe heals properly! 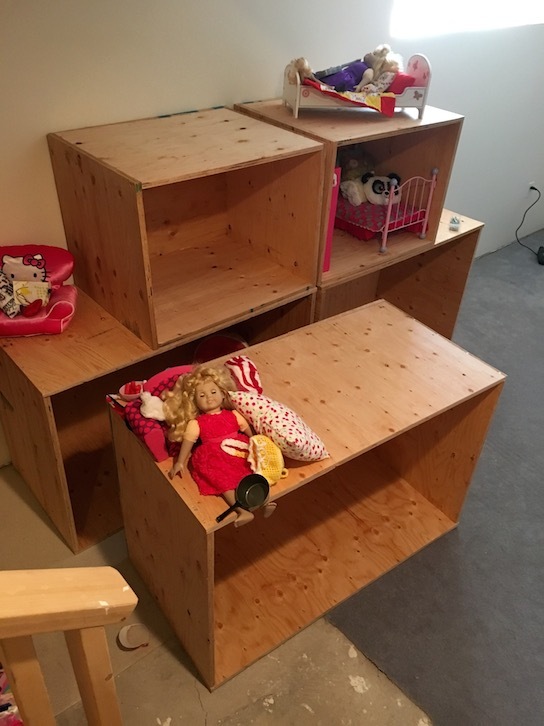 I love the idea of boxes for the dollhouses, it makes it easy if further down the road you need to move it. Yours turned out great! I wish I had a wall big enough to do something like this, the drawbacks of a 1950’s style house. 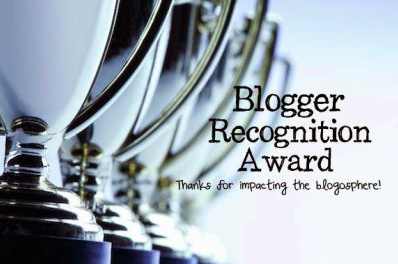 Aw thanks! I definitely don’t want to have to move it! LOL! But you’re right, if I ever had to then I could! I love the dollhouse. My late father made similar ones for our books. He did it with an old Victrola and television. Your husband is handy. Your dolls and furniture are so nice. WOW! What a beautiful project. Your basement is done so nice. I love the dollhouse. All of your dolls are cute. My favorite thing is that gorgeous horse. Makes me wish we had a basement! Where we live, there are virtually no basements, as we are too close to the water line and they tend to fill up with water. Not awesome. 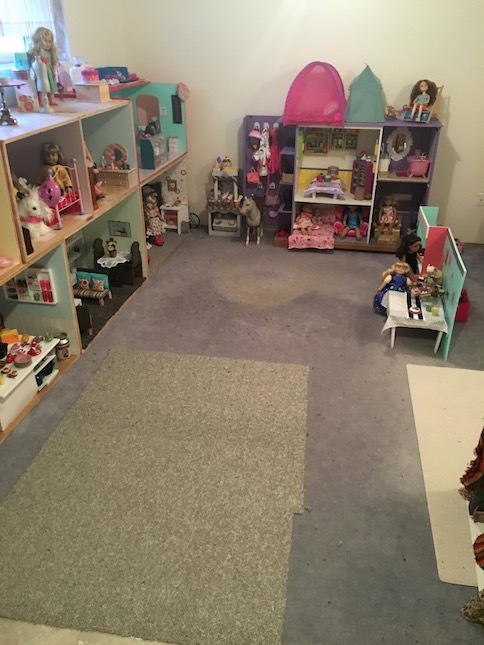 So my daughter’s dolls live in a corner of her bedroom. We are constantly rearranging things to accommodate them. 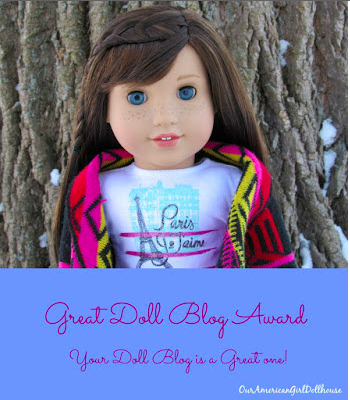 Hers are only 14″ Hearts for Hearts dolls, and so far she only has three. Not sure there’s room for much more than that! This project is so super amazing. I really, really wish we had a space for something like this! I would definitely love making something like this. You guys did an outstanding job!! Oh my goodness, this is fantastic! It makes mine look mediocre! 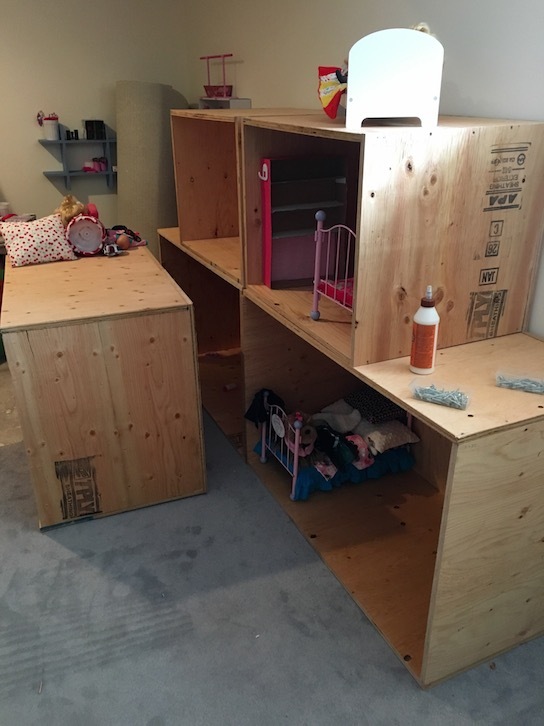 Love the idea of using plywood boxes. 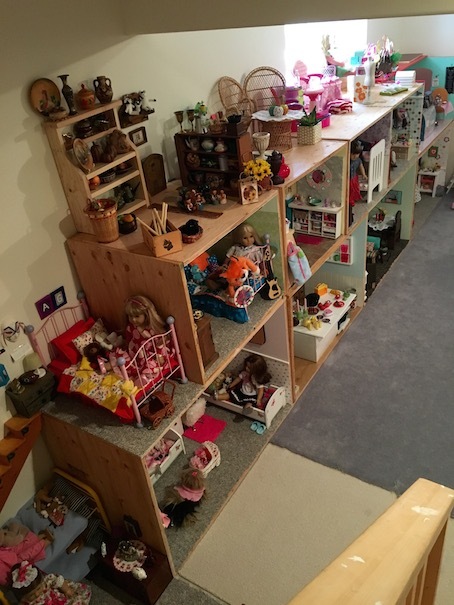 We have a few more dolls now needing rooms, and not enough room in the dollhouse so may need to use that idea.